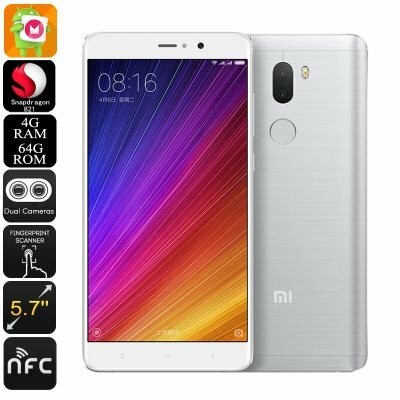 Successfully Added Xiaomi Mi 5S Plus Android Smartphone - 5.7-Inch Display, Dual-IMEI, 4G, Android 6.0, Quad-Core CPU, 4GB RAM, 13MP Cam (Silver) to your Shopping Cart. With its sleek and stylish design, the Xiaomi Mi 5S Plus is a high-end smartphone that, besides its beautiful looks, also packs some great hardware. Featuring the 64-bit Qualcomm Snapdragon 812 CPU that has been clocked at 2.35GHz, this Android smartphone is capable of handling the most demanding of media and latest mobile applications without dropping a frame. Along with a stunning 4GB of RAM, this Xiaomi phone is a real power horse that supports excessive multitasking sessions. Enjoy the latest movies, games, and mobile applications – no matter what you throw at this Android phone, there is nothing that will slow it down. Bringing connectivity to entirely new heights, this Android smartphone supports both 4G and Dual-Band WiFi. No matter where you’ll be heading next, with this Chinese smartphone at your side you’ll always be able to enjoy the fastest data speeds out there. Browse the web, stream movies, and download files – a laggy internet connection will be an issue of the past with the Xiaomi Mi 5S Plus in your pocket. Added to its ultra-fast internet speeds, this Android smartphone furthermore features two IMEI numbers, providing you with all the means necessary to efficiently separate work and private life within one device. This Android phone will make sure that you’ll always stay connected to all your friends, family, and loved ones back home. Running on an Android 6.0 operating system, the Xiaomi Mi 5S Plus brings along a smooth and powerful performance that lets you enjoy the latest smartphone features. With 64GB of internal memory, you can be assured that this Android phone packs enough storage for you to save all your files and media alike. From now on you’ll be able to bring along and enjoy all your favorite media on the phone’s stunning 5.7-Inch Full-HD display at any given moment, assuring that you’ll never have to be bored again. Along with its 3700mAh battery, this Chinese smartphone brings along countless hours of usage time – allowing you to enjoy all the phone’s features throughout the day without needing to worry about battery life. For all the mobile photography lovers among us, the Xiaomi Mi 5S Plus packs an epic 13MP rear camera that lets you snap breathtaking pictures and stunning video at any given moment. Whether you spent a casual night out with your friends at a bar, or are enjoying an amazing view during your upcoming holiday abroad – thanks to the 13MP camera of this Android phone you can be assured that never again a special moment in life passes by uncaptured.